Samsung PS51D945 review | What Hi-Fi? 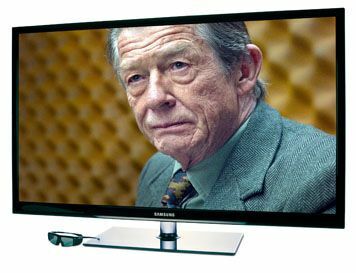 A 51in television for less than £600: Samsung’s PS51D945 plasma seems an improbable bargain. Its price is so low, indeed, that it serves to plant a seed of doubt in your mind. Surely a TV this big and this cheap can’t be any good? You’d be surprised. Of course, the PS51D945 is a compromise: it’s limited in a variety of ways. All the same, when displaying Freeview HD, DVD or a decent Blu-ray, the picture quality is mostly good and, in some regards, excellent. Given that it’s also attractively styled, well built and very, very big, it’s easy to see its appeal to some buyers. So, those limitations. First, this is an HD Ready panel, not Full HD: its 1365 x 768 resolution is incapable of displaying every pixel on a 1080p signal. And yet, for standard-definition Freeview and DVD pictures, that’s simply not an issue; it’s not a factor with the 720p resolution of most PS3 games, either. With those sources, the Samsung’s vibrant colours and largely crisp edges combine to create eminently watchable high-definition images. In theory, the Samsung’s reduced pixel count could be more of a worry for Blu-ray fans; but it doesn’t work out that way in practice. That’s partially because downscaling is less taxing on a TV’s image processor than upscaling. Feed the PS51D945 a 1080p picture and its pictures are very enjoyable. Indeed, black depths in Thor are up to par with the best-performing LED-backlit sets in this test, as befits the set’s plasma technology. That same tech, however, when coupled to the lower resolution, also contributes to the slightly noisier feel to backgrounds and edges, plus the occasional judder with long, steady pans. In that sense, this TV is revealed for what it is: a slightly old-fashioned set competing against newer, more efficient contemporaries. And that extends to its 3D presentation – noisy, cluttered by crosstalk and lacking in overall resolution – and to the set’s streaming services – of which there are none. This is a TV from a bygone age, when televisions were dumb receivers, not smart hubs. The sound, too, is underwhelming. Despite the various limitations, this huge television really is an improbable bargain. Accept it for what it is, and you’ll likely be delighted with what it has to offer.